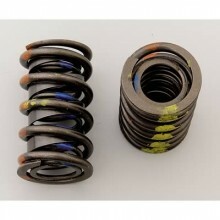 Outside Diameter of Outer Spring (in) 1.430 in. Coil Bind Height (in) 1.120 in. Spring Rate (lbs/in) 275 lbs./in. Inside Diameter of Outer Spring (in) 1.005 in. Inside Diameter of Inner Spring (in) 0.730 in. Isky has valve springs to cover all applications. Whether you're looking for street or all-out competition in single, dual, and multi-coil designs, Isky has a valve spring for you.